Chapter 10 is entitled, The 20/20 Vision Advantage. 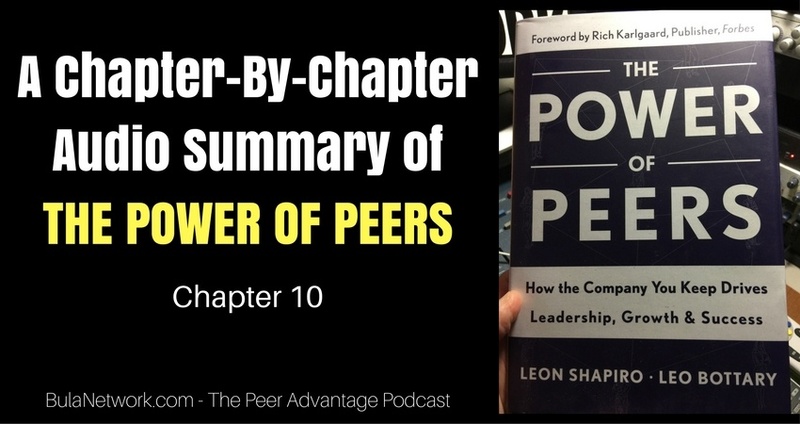 We’ve rounded the final quarter pole of the book, THE POWER OF PEERS by Leon Shapiro and Leo Bottary. By now we’ve come to understand how powerfully true the subtitle of the book is, “How the company you keep drives leadership, growth and success.” The authors have provided numerous examples proving the validity of that statement. You’d think more CEOs and business owners would avail themselves of the opportunity to surround themselves with their peers so they could experience THE PEER ADVANTAGE. But as Keith Ferrazzi and others have noted, these relationships don’t just come about naturally. They’re formed with intention and purpose. I suppose that’s one reason they can be rare, mostly finding their way into the lives of the very best of the best. Just another reason why you should give serious thought to joining their ranks. And it’s a chief reason why Bula Network is now forming the first two charter groups of THE PEER ADVANTAGE, exclusively for U.S. based small business owners. THE PEER ADVANTAGE is an online peer advisory group comprised of 7 small business owners from around America who come together twice a month for 2 hours each time – that’s a total of just 4 hours monthly – expressly to grow their businesses and their lives as business owners. This isn’t kumbaya kind of stuff. It’s real-life, real-time business building where we can come together to discuss our biggest issues and opportunities. Quite simply, it’s about us joining forces to put in the work to take your business to new heights of achievement and success. Chapter 10 begins with a quotation from former MIT Engineering School dean Gordon Brown. “To be a teacher is to be a prophet. We are not preparing children for the world we have lived in, but for a future we can barely imagine.” The same could be said of CEOs and business owners as we try to build and prepare our companies for the future. Broadening your view and expanding your perspective can be accomplished when your peers bring it into a view unlike anybody else in your life. When we exchange experiences and ideas from peers who occupy different spaces, different industries – we can more easily make application to our own circumstances. Your peers can help you more easily evaluate your challenges, take advantage of your opportunities and chart a course for your future. That’s how peer advantage provides a vision advantage. It helps you not only prepare for the future, but shape it. In 2008 the recession had a serious impact on many businesses. The authors talk about one CEO of a jewelry designer and consultant with jewelry in more than 2000 stores nationwide. Luxury and accessories were hard hit by the downturn. The CEO responded quickly by focusing her designs on a fashion-forward appeal. She was part of a CEO peer advisory group. They encouraged her to travel and maintain a trade show presence in spite of the investment. That steady persistence secured Macy’s as a new client in Q3 of 2011. In 2012 she increased her business 40%. During this troubling time her CEO group worked as a functioning council ready and able to help her steer her company successfully. She not only met the challenges, but she created opportunities. All at the urging of her CEO group who were seeking her best interests. She was able to see more clearly with the help of other CEOs in her group. It prevented her from being blind-sided or short-sighted. Looking back, we can see what happened to the economy in 2008, but there were business owners and CEOs who saw it coming. They didn’t know exactly what was coming or how deeply it would impact business, but they could see a storm coming. So they responded and prepared, thanks to the foresight provided by their peer advantage group. In 2006 there were a number of CEOs in Atlanta who were part of a group. Part of their collective work involved following an economist with a solid reputation for tracking the global economy. Signs of a banking crisis began to appear on the horizon and one of the CEOs in the group, a banker himself, agreed that it was just a matter of time when people would be scrambling. The group knew a correction was coming and figured it might come by late 2008 or early 2009. Other members of the group were seeing signs in their own industries. All this resulted in the group sticking together to prepare and help each other. The banker in the group led them through a series of exercises to prepare. Each company was credit line dependent so they were all able to keep their current financing or get new financing thanks to these exercises. The group members also knew that when the crunch hit members might be tempted to cut the investment of being in the group. They all agreed it would not be a good time to leave the group, simply to save a few bucks a month. They agreed they’d stick together no matter what. Today, every CEO is in place in the group and in their company. Each member is thriving. Planning and preparation are important. As the German military saying goes, “No battle plan survives contact with the enemy.” There are always unknowns. Dwight Eisenhower said, “In preparing for battle, I have always found that plans are useless, but planning is indispensable.” You may not be able to predict, but you can – and must – plan. Sailboat racers will tell you that no two races are the same. Too many variables are in place – like wind, weather, equipment, competitors and more. Sailboat racers say that to win, you have to get your head out of the boat. It helps to pay attention to the instruments, but it only matters relative to the other boats in the race. Working with a diverse group of CEOs or business owners is a way to get your head out of the boat, to stop working in the weeds of your business — and to start working seriously on growing your business. Business owners and CEOs are challenged to future-proof their businesses. Agility is the advantage. Peer advantage provides that. CEOs and owners are advised to consider factors from the customer’s perspective rather than thinking in terms of macro trends, income, sales and profit ratios. How do customers see their own situation? How are they making their decisions? The more we can become acquainted with customers in other spaces, the more objective we can be and the more likely we’ll be to spot trends that can guide us in our own decision-making. That distance from our own situation allows us to be more objective. We’ll be better able to see trends we may not have otherwise seen. Working with peers outside our industry provides us that vision. The authors liken looking at macro data to driving our car forward while looking in the rearview mirror. The past is the past. It may not provide much guidance on the present or the future. Gone are the days of undisrupted industry. So now we all must think like a futurist. She suggests that the SWOT analysis remains valuable today. The problem is that the SWOT tool is extremely limiting. Connelly suggest the problem is you don’t own your strengths, your customers do. They’re the ones who determine where you’re strong. And they’re fickle. Another way the SWOT is limiting is CEOs can be blindsided by competition. Often unlikely competition. Think Blockbuster and Kodak. Their failure to respond didn’t end well. Rather than a SWOT analysis, look inward, broaden your view and focus on what you can’t control that could impact your business. Stay on top of trends, technology advances, economic drivers, environmental concerns and political dynamics. Then consider what Ms. Connelly describes as wild card events, such as 9/11 or the 2013 earthquake in Japan. Those events have an immediate impact and have to be considered in real-time. One approach is to exhaust the “what if?” questions. Take a look at your business from 10,000 feet. Ask all the questions about things beyond your control. And employ scenario planning. Look at your assumptions and question them. CEOs and owners who have the peer advantage are surrounded by others who will help them do that. They can uncover each other’s blind spots and help each other see things more clearly. The chapter then dives into a number of examples where CEOs and owners were able to seize opportunities. It’s not just about dealing with problems. Improved vision helps us spot opportunities, too. There are solid stories of groups that helped each other see and examine opportunities that might have otherwise gone unnoticed. The final part of the chapter shows how peer advantage can improve vision to allow members to see things more globally. We’re all prone to silo ourselves. We occupy our space, our industry. We run with folks who also operate in our space. It can restrict our point of view and narrow our field of vision. But through peer advantage we can truly see and understand how all the different sectors of industry interface with one another and how connected we all really are. The chapter’s summary reminds us of how our parents hoisted us up on their shoulders to give us a better view when we were too small to see clearly. That elevated height enabled us to see. In a peer advisory group we stand on the shoulders of our peers who help us see better than we ever could by ourselves. They lift us up so we can get a better view. The trust and mutual respect you share in such a group give you permission to challenge one another’s assumptions, see opportunities where others may just see problems, exchange ideas that may be common place in one industry, but unheard of in another. I hope THE PEER ADVANTAGE by Bula Network can provide that experience for you. Find out more by visiting ThePeerAdvantage.com.